It’s time to get a shipping container in Highland UT. Which means it’s time to call Haulaway Storage Containers, Inc. We have been leading this industry for almost 50 years. Our quality containers, affordable prices, stellar service and convenient delivery system will wow you. Order your storage container rental today so you can start storing tomorrow. Decades ago we realized that portable storage was a niche that had not been filled. Conventional storage units are expensive and they don’t come to you. You’re stuck lugging around all of your belongings. This is not practical when you’re working on a job or project. We knew that bringing the storage container to the worksite would change everything, and it did. Imagine building your very own storage shed onsite without actually having to build anything. Instant storage dropped off in your backyard. That’s what Haulaway does for you. This saves you dollars and hours, as well as headaches. The shipping container ordered for your Highland UT property will always arrive on time (we are extremely punctual). It will be clean and ready for your immediate use. Every storage container we offer is protected from both thieves and Mother Nature. They are all fitted with high security locking systems and all are wind and water-resistant. If you require greater security be sure to ask about our Rhino Locking System. Our container sizes range from as large as 40’ all the way down to 10’. Our 10’, 21’ and 26’ models have been designed to allow for easier loading and unloading; they have double doors on both ends. No matter what job or project you are facing, we have the perfect container for you. 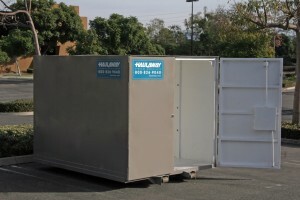 Call Haulaway Storage Containers today. You will receive a free quote about renting a shipping container for your Highland UT home or business. We look forward to helping you achieve a job well done.